2019 CHAMBERLAIN SCHOLAR - MARGO MALLAR, DEVELOPMENT SPECIALIST, INSIGHT MEDITATION SOCIETY. cONGRATULATIONS mARGO! The Chamberlain Scholarship program honors Ralph E. Chamberlain, CFRE. Mr. Chamberlain had a long and distinguished career of service to the Association of Fundraising Professionals (AFP), beginning in the 1960s when the organization was formed as the National Society of Fund Raisers (NSFR), through the late 1970s when the name was changed to the National Society of Fund Raising Executives (NSFRE), and until his death in 1999. Mr. Chamberlain’s dedication to the organization we now know as AFP never faltered in his long volunteer career with the Association. Because of his long-time support of the Foundation’s annual fund and generous planned gift, the AFP Board of Directors renamed their Conference Scholar Program in 2000 to honor Mr. Chamberlain’s memory and commitment to the Association. Read the full bio here! 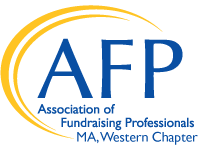 The AFP Foundation offers every AFP chapter in accord for 2018 one Chamberlain Scholarship, which covers the recipient’s conference registration, minus a $10 processing fee, to the AFP International Conference on Fundraising in San Antonio in 2019. The scholarship is available to individuals who have never attended an AFP International Conference. Chapters are encouraged to promote the Chamberlain Scholarship program locally. Application deadline: Tuesday, October 30, 2018. The AFP Foundation for Philanthropy created a new scholarship fund for members of diverse communities to attend the AFP International Conference on Fundraising. This scholarship is for current AFP Members who have never attended an AFP / NSFRE International Conference. AFP is able to offer $1,500 scholarships ($595 conference fee + $905 for travel expenses) for each of the currently identified AFP diverse communities. The African-American Diversity Scholarship Fund – reserved for applicants of the AFP African-American diverse community of fundraising professionals. The Gay, Lesbian, Bisexual and Transgender (GLBT) Scholarship Fund – reserved for applicants who are members of the AFP GLBT diverse community of fundraising professionals. The General Diversity Scholarship Fund – reserved for applicants who identify themselves as members of the AFP diversity community of fundraising professionals.